Buildings are most comfortable and use the optimal amount of energy when they are configured and managed correctly. I remember the first time I learned about energy and buildings; that there was no such thing as a "free lunch" when balancing energy use, comfort and savings. Thirty years ago, I was a fresh-faced 26-year-old Honeywell service tech in the greater Los Angeles area. A new "hot shot" building manager had just come into one of my customer accounts. At the time it was one of the most technologically advanced office buildings in the world. This manager put out an energy savings edict: "Raise the chilled water set-point five degrees!"' She was going to save lots of energy. Or so she thought. After the adjustment hot calls flooded in. The Honeywell system was immediately blamed. It was a domino effect. The thirty-five floors of built up AHUs were running full out. 100% maximum electrical use. The three 1,100-ton chillers were using slightly less electricity. But this minuscule "gain" with the chillers was vastly over-shadowed by the huge increased energy use by the large built-up fans. Every one of the hundreds of VAV zones boxes in the building was wide open. The entire system was operating outside of its design. Energy use went up...dramatically. My boss and I were summoned into a meeting with the property management executives and the owners of the building, to explain what we were going to do to "fix" the building automation system. They were threatening to cancel the Honeywell service contract due to (my) "poor" performance. I told them that there wasn't anything wrong with the BAS; the configuration of the BAS had been altered outside of its design parameters. I recommended that they LOWER the CHW set-point SEVEN degrees; not just back down five. Obviously, this didn't go over too well. This didn't make sense to anyone in the room except me. The chiller is the single most energy intense user of electricity in the building, they argued. "Yes!" I said. But that's not the whole picture. I pulled out some scribbled notes. I had the nameplate data, specs, and operational kW trends from my DOS based Honeywell front end. It showed that although the Chiller energy use was down 15%, AHU energy use had doubled! "Penny smart...dollar dumb" as my Dad would say. The building manager was focused on squeezing every ounce of efficiency out of the most efficient part of the total energy equation. Chillers are made to chill water, that's what they do, and they're very efficient at doing that. Reluctantly they took my advice. My boss warned me that if I was wrong, most likely we would lose the contract. In the end, energy use at the building was significantly reduced (by double digits). That was the day I learned that correctly managing buildings is very hard. It's not an intuitive process. Somewhere over the years, we lost our way. Personally, I blame Demand Response programs. Call it the "DR Effect." Energy Management has become mainstream. Simplified. It's on the cover of newspapers, magazines and on the Internet. Everyone knows that to cut peak demand during a prescriptive DR Event you do what? Raise the set-points. That's our "go to" strategy. Comfort is perhaps sacrificed, for a moment. Then, like the building manager and the Chiller, the thought is "well, if you save energy by raising set-points during a DR Event, why not do this all the time?" Simple. That's when the logic flaw is revealed. 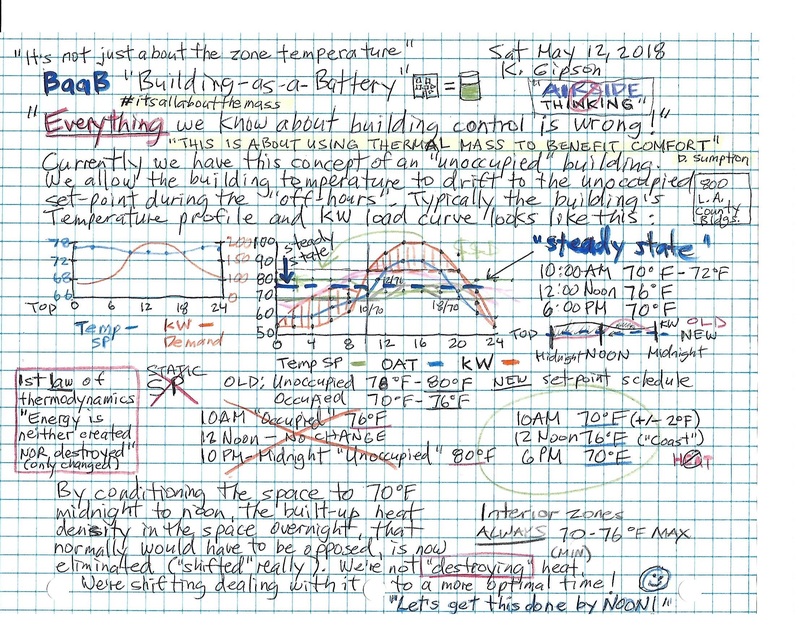 You didn't "SAVE" (destroy) the energy use by your simple set-point change strategy. You merely shifted it to a cheaper (off-peak) time. At the end of the DR event, all the building zone temps are high, and the energy use increases greatly to cool the hot zones back down to set-point. In controls, that's called the "rebound effect." Not meant to be a long-term, permanent strategy. We are struggling as an industry to define the "value" of comfort in a building. Comfort has become a lever that's "pulled" in order to save energy. But we don't have to, comfort and energy savings go hand in hand. Buildings are most comfortable and use the optimal amount of energy when they are configured and managed correctly. If a customer is experiencing a high amount of comfort issues, most likely the energy use is high as well. There was a time when energy management was a science, an art, and a craft. Although we didn't have "fancy" machine learning and terabytes of information, we made due with the "primitive" DOS based and embedded 16K memory systems we had back then. Furthermore, we understood control theory. Very well! A PID loop wasn't just a block in a wire sheet or flow chart. It was a set of intricate mathematical equations handwritten with a pencil, paper and HP Scientific calculator. We knew what the Proportional, Integral and Derivative portions of the PID loop equation meant. We understood that there's an affinity between the building design, the weather, the equipment and the occupants. We knew what a building "balance point" was. In general, buildings have been managed as though there's a "trade off" or sacrifice between energy efficiency and comfort. This is not, however, a zero-sum game. If we can expand our view to take in the total picture, we as an industry can have a "win-win" situation. Why is comfort important? It is an indicator of how well the building is dialed in and efficient. A "vital sign." Like a fever in a flu patient, a hot building is an indicator of how sick it has become. "Is your building running a fever?"